Relief Society General President Sister Linda K. Burton stood last April at the Conference Center podium and challenged members across the globe to prayerfully find ways to serve refugees living in their neighborhoods and communities. What each refugee needs, she declared, “is a friend and ally who can help them [adjust] to their new home—a person who can help them learn the language, understand the systems, and feel connected” (“I Was a Stranger,” Apr. 2016 general conference). A Church-sponsored, worldwide refugee relief effort called “I Was a Stranger” was initiated and championed by the First Presidency. Those shared calls for compassionate action sunk deep in the hearts of Latter-day Saints a continent away in the Santiago Chile San Miguel Stake. Many of the members prayed to be that “friend and ally” to one of the world’s many refugees. They searched for opportunities to serve in their own neighborhoods. 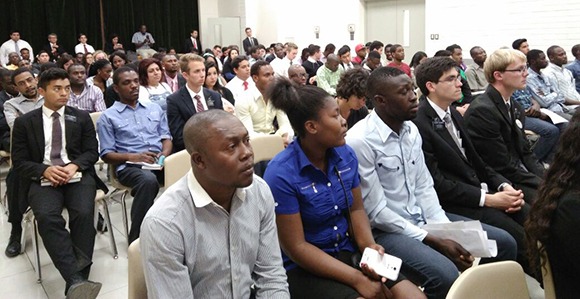 Over the past few years, a wave of Haitian immigrants has arrived in the greater Santiago area. More than 40,000 Haitians have reportedly settled around the Chilean capital city. While technically not classified as refugees, most of the Haitian immigrants trying to make a life in Chile are facing challenges familiar to refugees. Few speak Spanish—Haitians speak French-influenced Haitian Creole. And few understand the local Chilean culture. The San Miguel members began collecting warm clothing, blankets, food, and toiletries to give to their new Haitian neighbors. Soon they were learning the names of the Haitian immigrants. Their donations were accepted with warm smiles. Friendships began to form. The next step was to help the Haitian immigrants build connections to their new community. The Chilean members understood that compassionate service stretches beyond the temporal. They were also eager to care for the spiritual needs of their Haitian friends. So a Creole-language devotional was organized in September. Latter-day Saint Chileans rejoiced last month when Elder Ronald A. Rasband of the Quorum of the Twelve Apostles and Elder Craig C. Christensen of the Presidency of the Seventy visited Santiago. The members marked the event by organizing another relief project with the assistance of the Church Welfare Department. A donation of stoves, mattresses, food, blankets, clothing, diapers, and other items was made to the city of San Bernardo. Some 60 Haitian families were the beneficiaries of the much-needed goods. Elder Jose A. Teixeira of the Seventy, who presides over the South America South Area, is certain the Latter-day Saints are making a difference.